In a grand ceremony held at Shanker Hotel, Lazimpat, Nepal’s first Open Source Software competition concluded on 8th August 2009. The 8 months long Open Software Challenge Nepal (OSCN) 2009 was able to attract 83 projects out of which 12 had made it to the grand finale. Leaping ahead with the spirit of the open source movement and promoting a platform by rewarding the innovative software developers in Nepal, OSCN was the first of its kind of a pioneering event conceptualized and hosted by D2Labs.org. 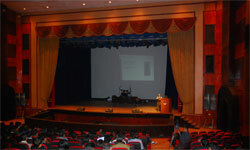 OSCN was jointly organized by D2Hawkeye Services and Tribhuvan University, Institute of Engineering, Pulchowk. OSCN had also been greatly supported by FOSS Nepal since Jan-05-2009.